A bar POS system is designed to help bar staff and managers oversee beverage service, so it must do more than a standard retail POS system. Drink recipe lists, substitutions, price scheduling, split inventory for liquor pours, and tab management are just a few things to look for in bar POS software, and what our five picks provide. Which POS System is Right for Your Bar? A good bar POS system puts these features at your fingertips to make every aspect of your business run smoothly. You can serve drinks faster, closely track inventory, allow patrons to pay however they wish, and monitor every aspect of your beverage service business — all within one streamlined system. Here are the five best bar POS systems for startups, small operations, and fast-growing bar businesses. We recommend Square POS for bar startups and small bar operations because it delivers a fully integrated set of inventory, sales, ticket management, and payment tools for free. As you grow and need advanced features like detailed drink recipes and modifiers, staff tracking, and happy hour pricing, you can easily transition to the feature-packed Square for Restaurants POS for just $60 per month. Whether you need an entry-level, zero-cost POS system or a full-featured POS with advanced features for your bar, Square fits the bill. 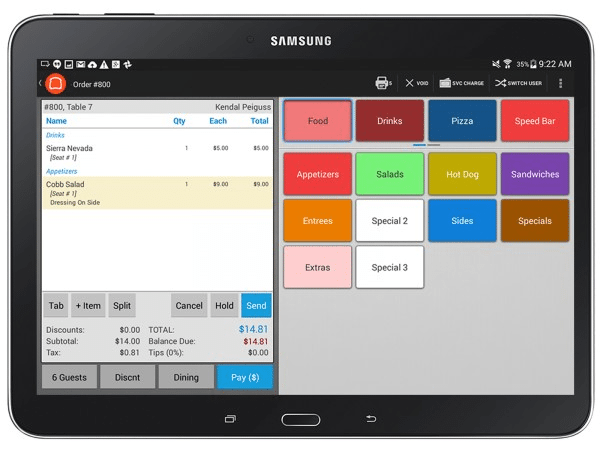 Use free Square POS on unlimited tablets and smartphones for easy tableside or register ordering. Patrons can even add tips and e-sign right on the screen. As you grow, you can transition to Square for Restaurants which includes many bar-specific features like drink menus and modifiers, plus advanced staff and ticket tracking — all for just $60 per month. Don’t let Square’s free POS software price tag fool you, Square POS packs a lot of punch. Square provides a completely seamless suite of sales, payment, inventory, staff, and customer management tools in its free system. Tailoring these capabilities to beverage service and bar sales is a piece of cake. 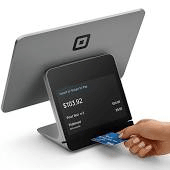 Most features listed above are included in Square’s free POS system. The advanced add-ons* have added fees — but you can add them as needed, so you only pay for what you use. At $0, Square POS is certainly priced right for the shoestring startup. If you need advanced bar POS features as you grow, upgrading to Square for Restaurants is quick and easy. 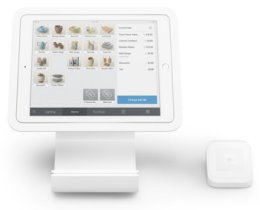 With impressive free features and as-needed expandability, it’s no surprise that small businesses and multimillion-dollar operations alike use Square. 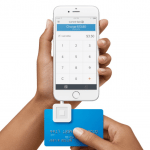 Square is a free POS system. That means there are no monthly, startup, or cancellation fees to access and use the POS software on your smartphone, tablet or computer. So, if you already have an iPad or smartphone, you can quite literally run your bar using Square POS on your existing device and have no initial costs at all. The only fees you pay to Square are payment processing fees when a customer pays with a credit card. Even then, Square’s low flat-rate card processing fees hold no surprises. You pay a small percentage of each sale, usually 2.75% on typical tabs, and that’s it. No hidden transaction fees, batch fees, or other charges at the end of the month. You have to use Square to process credit card payments — Square is a payments processor and that’s where they make their money. You can’t use your own merchant account with Square POS, which means you can’t shop providers for lower rates. However, until you’re selling about $30K/month, Square tends to be cheaper than traditional merchant accounts anyways. When you reach that volume, you can usually negotiate a lower processing rate with Square, too. Square’s inventory system doesn’t split inventory or track recipe ingredients — Square’s free POS inventory system will let you track complete items, but it doesn’t let you create drink menus that connect ingredients (like pours) to specific drinks. Also, you can’t split an inventory item, like a bottle of wine, into 4 servings. 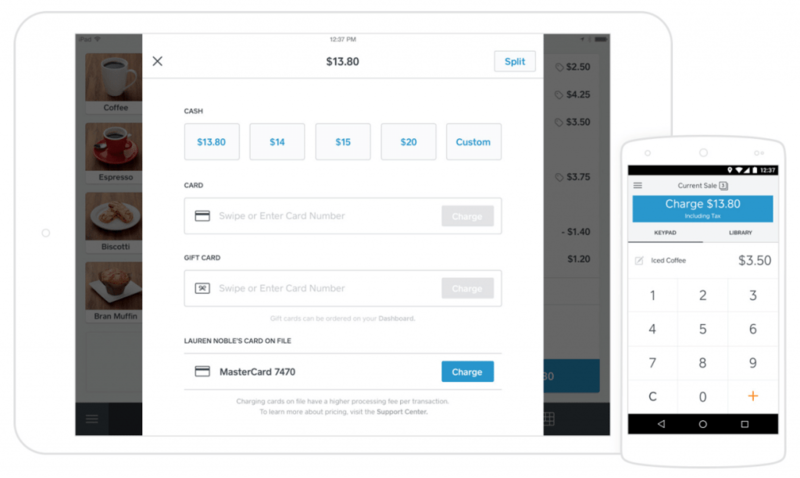 To easily handle this, you’ll need Square for Restaurants, which starts at $60 per month. However, in Square’s knowledgebase, you’ll find all sorts of clever user workarounds in the free POS. For example, one user enters all wine bottles as “Quantity 4,” then multiplies her physical counts by 4 when checking stock. So, there are ways to get these things done in Square’s free POS — if that’s best for your budget. 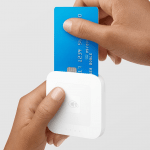 These two sticking points might make a difference in a mid- to high-volume operation, which is why we say Square’s free POS is best for smaller bars and startups. For these users, Square really delivers an amazing value in a sleek, low-cost POS system. Plus, the fact that it can be upgraded to Square for Restaurants as advanced features are needed is a very convenient perk. Toast is an ideal bar POS system for the growing establishment that wants to track every aspect of its service using handheld devices, registers, or a combination of both. Toast’s top-notch bar POS software lets you manage the fine details of beverage service, including tracking pours for tight inventory controls, creating drink menus with customization options, and monitoring staff cash drawer access. 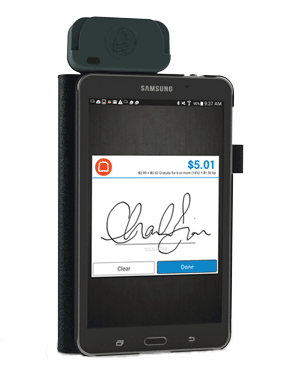 It does all of this in a sleek Android-based interface that provides just about every beverage service feature a bar owner could ask for in bar POS system. It’s the small details, like splitting inventory to track drink pours and tying drink recipes to inventory usage, that make Toast an ideal bar POS system for growing businesses. These small things all add up and help you run your entire operation more efficiently. Plus Toast’s excellent staff tracking features help you pinpoint security issues and minimize cash losses. Another nice feature is Toast’s 24/7/365 customer service, which is a big plus for an after-hours establishment. If you have a technical issue at 11 pm, Toast has you covered. Perhaps the best thing about Toast’s stellar suite of bar management features is that it frees up your time to focus on business-building activities. In fact, Toast also supports these needs with a good set of CRM tools and a detailed patron database. By tracking patron data per-sale, you can develop targeted marketing campaigns to attract repeat business or build out a sales-driving loyalty program. With monthly fees that start at $79, Toast offers pricing that’s very small business-friendly. 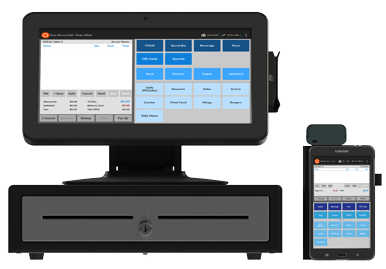 That $79/month gives you complete access to Toast’s top-notch bar POS software and usage on one device (sold separately) like a register station or tablet. You can connect additional devices for $50/each per month. So, if you want to run two complete register stations or use one station and one handheld device, or more, say for tableside ordering, you can easily do that with Toast. Toast also offers a range of register and mobile device options, like these, to meet your service needs and budget. Toast is Android-based, but unlike some other bar POS systems in this list, you must buy your register stations and handheld devices from them. You can’t download Toast to your own device, unlike Square and Lightspeed. That said, Toast’s registers and handhelds are competitively priced, here’s a look at Toast’s overall costs and range of hardware packages, see more here. As we state above, there’s little that Toast can’t do to help you manage and grow your bar business. But there’s one important feature that it lacks: You can’t use your own merchant account provider to process credit card payments. Like Square, Toast is its own credit card processor, so you can’t shop around for different credit card merchant account providers. Like Square, Toasts offers simple flat-rate credit card processing fees, but unlike Square, these fees aren’t published. You negotiate your fees based on your account needs and sales volume. In checking user reviews, rates don’t seem to be a source of complaints, but it’s something to keep in mind as you search for your ideal bar POS system. Lightspeed Restaurant POS is an ideal solution for bars owners that want to manage multiple locations via a centralized POS system. Lightspeed delivers multi-location management capabilities and targeted bar sales features at quite a low price. It supports inventory transfers between locations, multi-location staffing, per-location sales reporting, and much more. Add to that a stellar set of service-focused tab support, drinks lists, and split inventory tracking, and Lightspeed Restaurant POS is a top bar POS system to consider. Lightspeed POS is an award-winning multi-industry POS system that has been at it for years. But that doesn’t mean it’s a one-size-fits-all solution that lacks bar-specific details; far from it, in fact. Lightspeed Restaurant POS takes Lightspeed’s already stellar inventory, sales, and staff tracking features and fashions them into exactly what bar and restaurant owners need. And it does this all for a surprisingly budget-friendly price, especially for multi-register and mobile device users. Lightspeed handles most bar sales and management needs seamlessly. The base system makes managing tabs, customizing orders, tracking tips, tying split inventory to every sale, and staff management a breeze. Another plus over Square and Toast, Lightspeed lets you choose from several merchant account providers, like Cayan and others, for credit card processing. This lets you price-shop processors to get the best rates. If you need to manage sales, inventory, and staff across multiple locations, Lightspeed Restaurant POS has you covered. You can oversee all location-specific activities from one central hub. From there, you can break down reporting by location or look at aggregate data. You can even track patrons by location to target your email, social, and loyalty marketing efforts by location. 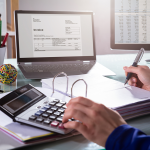 Lightspeed Restaurant POS offers 3 monthly pricing tiers to meet any budget, ranging from $69/month for 1 register to $198/month for up to 5 registers. So, you only pay about $40/month per register if you need 5, which is less per register than many competitors. Lightspeed register terminals are iPad-based and you can access the backend business management system from any mobile device or computer. 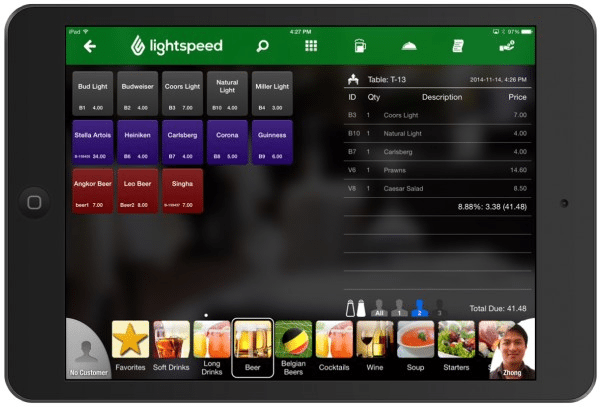 A big plus here is that you can download Lightspeed POS to your own iPads if you already have them. 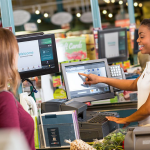 You don’t have to purchase new hardware from Lightspeed in order to operate its POS. For tableside ordering, you can even use Lightspeed with an iPhone. 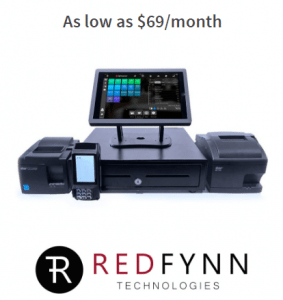 Of course, Lightspeed also offers register bundles or you can build out your own checkout register with a-la-carte iPad stands, cash drawers, and receipt printers. The takeaway here is that Lightspeed Restaurant POS lets you use the registers and devices that meet your specific service needs and budget, and you can use any iPads, iPhones, and computers that you already have. If you need lots of add-on features, like a loyalty program, email marketing, or online ordering, you’ll get these through 3rd-party integrations which can add to your total monthly costs. These aren’t built-in to Lightspeed. The benefit here is that you only pay for the add-ons you need. So, rather than paying a hefty monthly fee for bar POS software with every bell-and-whistle, Lightspeed Restaurant POS has streamlined base pricing and you can add just the features and costs that matter to your operation. TouchBistro is our top pick for high-volume bars that need to run a number of registers, generally 5 or more. 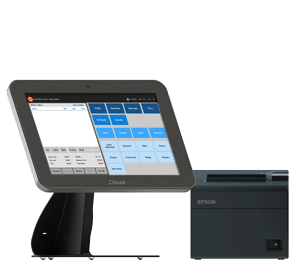 As an overall solution, TouchBistro delivers much of what the other bar POS systems in our list provide, but it can be pricey if you plan to use 2-5 registers or mobile devices. We find that TouchBistro offers the best value if you need to run 10 or more registers and/or mobile devices, such as in a busy sports bar or large table service operation. 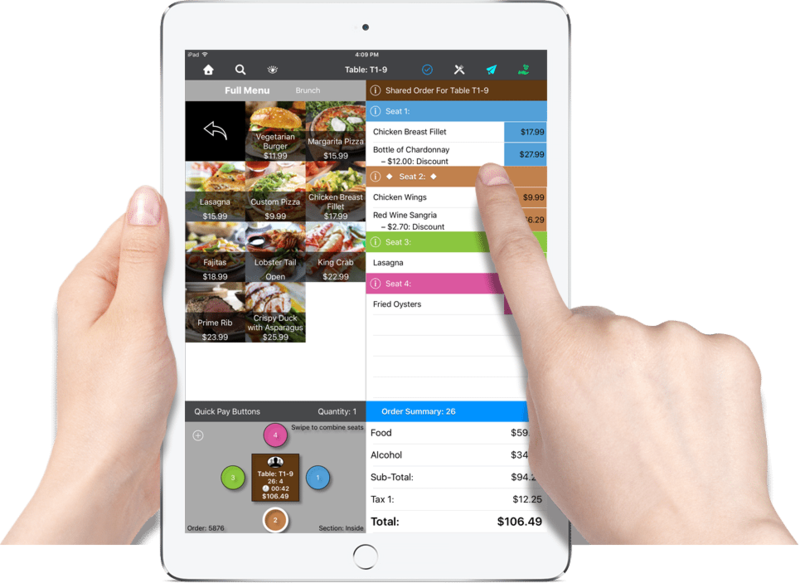 TouchBistro is specifically designed for food and beverage service and really shines when it comes to managing high-volume operations smoothly. You can even use iPad kiosks on your bartop for self-service ordering. Worth mentioning is that of our 5 top bar POS picks, only TouchBistro runs on an internal network, not a cloud-based system. This requires more setup, but can operate much faster and more consistently since you’re not subject to internet speeds or outages. TouchBistro works off of licenses, and each license equals one register or mobile device. 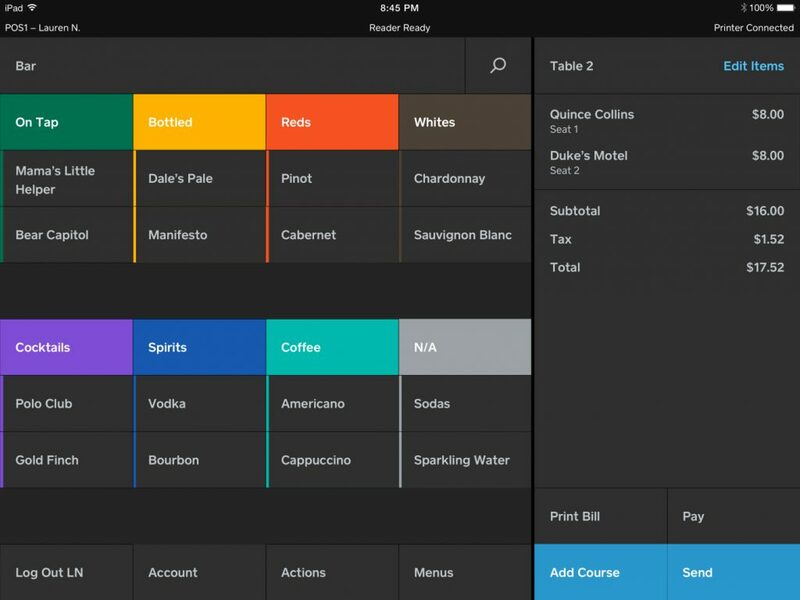 Every plan gives you full access to TouchBistro’s fantastic bar POS software. But for a small outfit, adding registers or devices increases costs quickly. At the 5 register level, LightSpeed Restaurant POS, at $198/month, is far less than TouchBistro’s $249/month 5-license plan. Where we find great value is in TouchBistro’s $399/month unlimited license. It sounds pricey, but if you move volume and need a combination of 10 or 20 registers and handheld devices for a large waitstaff, it’s a deal. TouchBistro is iPad & Mac-based, and you can build your own register station with an array of compatible devices, including iPad stands, cash drawers, printers, and touchscreens to fit your needs and budget. Cloud-based simplicity is what TouchBistro lacks. TouchBistro runs off of an internal network, so its setup can be more complicated and costly than the others on our list. This is especially true if you need to purchase the mini server required to operate more than one register. But, if you have a large waitstaff, need to run multiple registers and mobile devices, or want to give self-service kiosk ordering a try (sports bar anyone?) TouchBistro is worth considering. 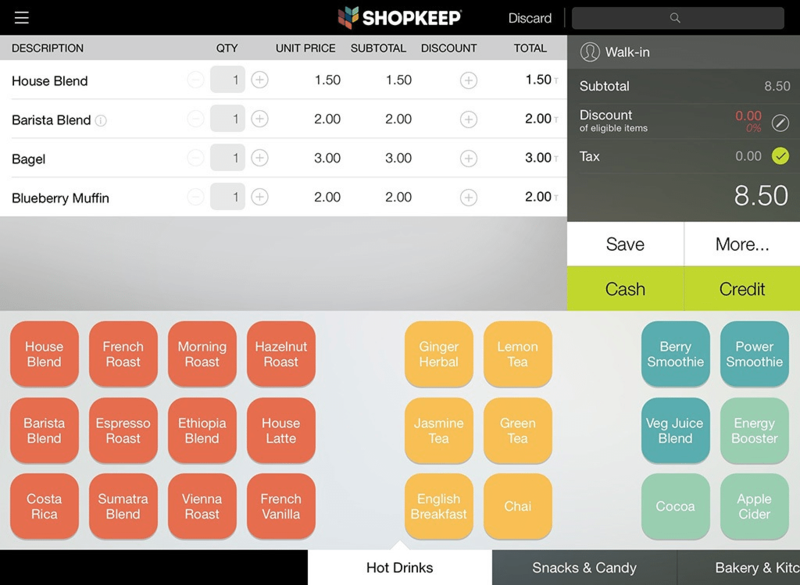 ShopKeep has a fantastic, super-detailed inventory tracking system that will let you track every drink on your menu to the ingredient, and tie any drink sale back to your ingredients inventory. If you need to keep a close eye on pours or tightly manage your craft cocktail ingredient stock to avoid shortages, ShopKeep POS can really increase your efficiency. 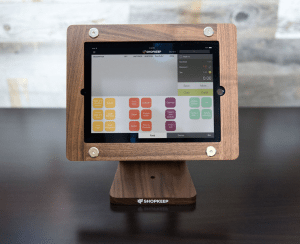 Like Lightspeed POS, ShopKeep is an award-winning multi-industry POS system that’s easily tailored to meet the needs of bar and restaurant owners. ShopKeep delivers stellar inventory, sales, and staff tracking features, and adds bar tab management, tableside ordering, plus numerous integrations that let you expand your bar management and marketing as-needed. Plus, you can use your own merchant account provider, like Cayan, or try ShopKeep Payments, built-in credit card processing solution. This lets you price-shop processors to get the best rates. 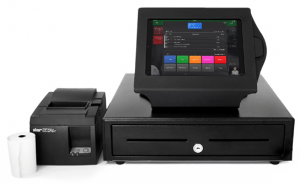 You can use a simple iPad screen checkout or build your own register starting around $800 with a cash drawer, iPad stand, and receipt printer. As a beverage and foodservice POS, ShopKeep is missing a few key elements that the more targeted restaurant and bar POS systems on our list provide. It doesn’t have a table layout screen, kitchen display system, or built-in online ordering or payroll. But you can add some of these features with paid integrations. Plus, each register you run is $69/month, so having a few registers plus a few mobile iPad checkouts can get pricey. At that stage, one of the more targeted bar POS systems provides more features for less. But, ShopKeep’s stellar reputation, excellent ingredient management, and on-the-spot customer service make it one to consider. When searching for the perfect bar POS system for your operation, you’ll find many options. Some packages are designed specifically for food and beverage service businesses, like Toast and TouchBistro. Others are tailored versions of popular multi-industry POS systems, like Square, Lightspeed, and ShopKeep. The most important factor in the selection process is you. Taking the time to list the features you need for your operation now, and what you anticipate needing in the future is key. That will help you pick the best bar POS system that can fit your business and budget now, and as you grow. Do you operate a bar or beverage service business using a POS system? Which systems do you use and why? We’d love to hear your experience and insight in the comments below.